I have been busy fulfilling pottery orders I am getting from friends and family. 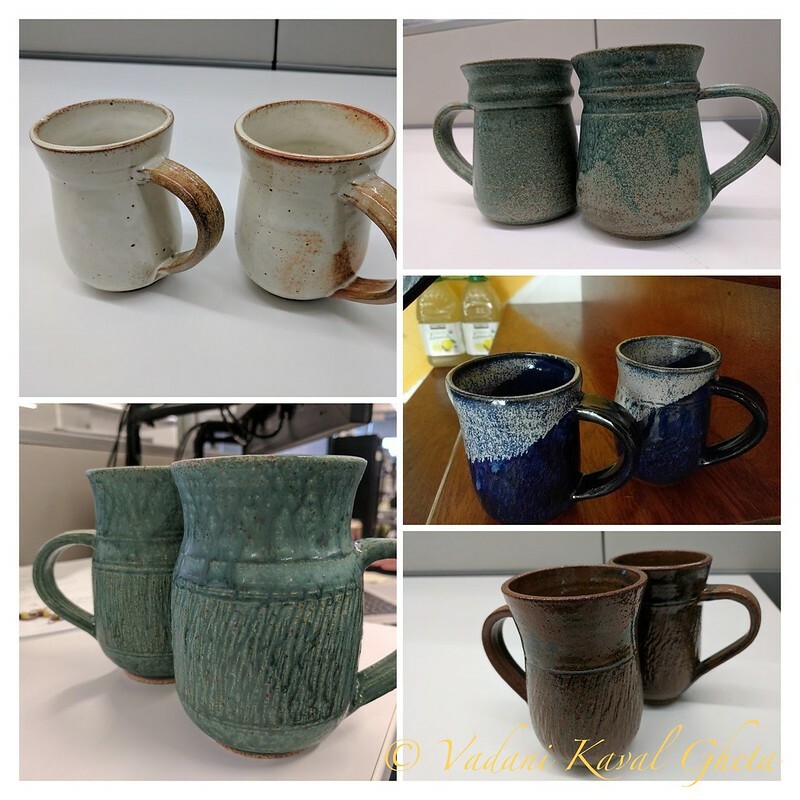 I made few sets of cups, few casserole bowls, and large pasta bowls in past few months. And almost all of them are sold out. It is very encouraging to see my creations fly off the shelf but now I feel the need to slow down and focus on my creativity :) It's always a battle in my mind "make to sell" or "creative making"!! Let's see if I can focus on my creations and try to sell that. 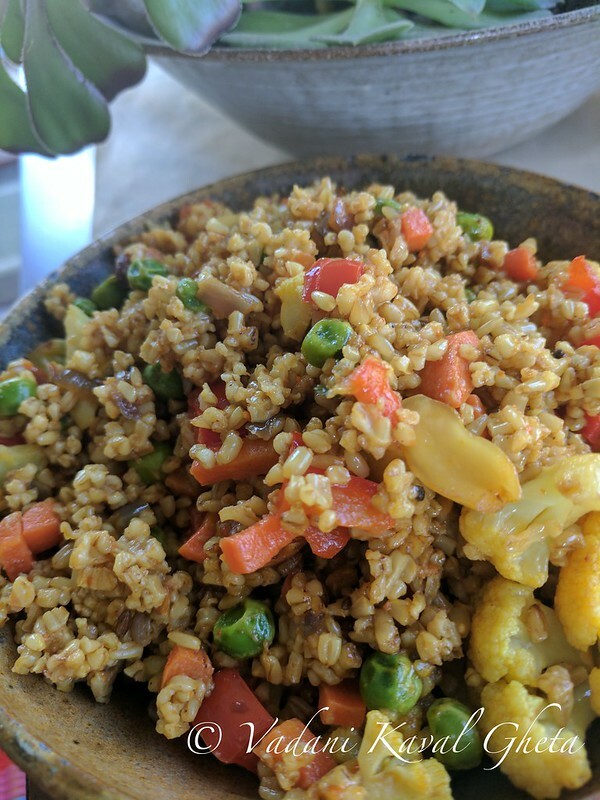 I am always trying to incorporate local grains like Quinoa, Oats, Buckwheat in my daily cooking. Oats is more versatile that anyone can imagine. I have been using steel cut oats to make Adai, Idli, Pongal instead of rice. As the grain is bit sticky/glutenous it is easy to substitute in these recipes. But I recently started making Puliyogare and Vangi bhat with steel cut oats and taste is awesome! It is a staple breakfast item if made ahead of time. Today's recipe is a generic recipe that can be used with any vegetables, masalas and adjusted to your taste. Dry roast oats on medium heat. Add just drop of oil if needed. Cook roasted oats with 3/4 cup water and pinch of salt either in rice cooker or in pressure cooker. Let the oats cool down and then fluff it with fork. Set it aside. Heat oil in a heavy bottom pan and add tadakha ingredients one by one. Let mustard seeds splutter. Add peanuts and roast just for a minute or two. Add all the mixed vegetables and saute for few minutes. Cover if needed. Add fluffed oats, sambar masala, salt, tamarind paste. Mix well and cover just for few minutes. Serve hot with Avaocado pieces or pickle. * I have used zucchini, bell pepper, carrots, cabbage, peas, and onion. And key is not to cook vegetables too mushy. Pav bhaji masala also tastes awesome instead of Sambar masala. Just omit tamarind paste and squeeze lemon while serving. Love your recipes! Hope you keep posting. And what beautiful pottery!! You are talented. The pottery you make is stunningly beautiful! Do you sell online too? Where are you based? I'd love to own a few pieces of the pottery!